If Dr. Coombs suspects SIBO, testing is required for diagnosis, and prior to commencing treatment. 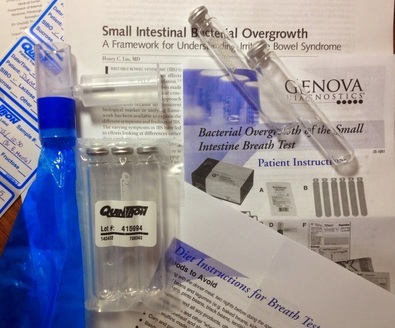 Testing for the presence of SIBO can be done using a hydrogen-methane lactulose breath test. This inexpensive, non-invasive test that can be done in the comfort of your own home. It is crucial to test prior to treatment, because testing identifies the type and the significance of the overgrowth, both of which factor into the treatment plan. The lactulose breath test for SIBO involves a 24-hour preparation diet to eliminate foods that the bacteria feed on. The morning that the test is performed, 10 breath samples are completed, with the first sample being used as a baseline. The subsequent 9 samples are produced at 20-minute intervals following the ingestion of the lactulose. Lactulose is a carbohydrate that is not absorbed through the small intestine, and only bacteria have the enzymes available to break it down. Collection of breath samples every 20 minutes over a 3-hour period allows for the lactulose solution to travel through the entire length of the small intestine. The changes in hydrogen and methane concentrations in sequential breath samples will indicate the presence, type and significance and location of the overgrowth of bacteria in the small intestine. It is very important to prepare the body for anti-microbial treatment. When the pathogenic bacteria are being killed, they release toxins that can cause any number of temporary symptoms including fatigue, nausea, food cravings, agitation, depression and general malaise. 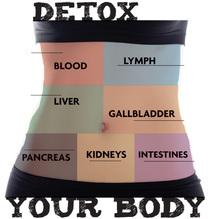 The liver is crucial to rapid elimination of these toxins. The longer the toxins are in your body the more intense these symptoms will be. By supporting the liver and other detoxifying mechanisms during this period we can reduce discomfort and prevent a relapse by stopping treatment. During the preparation phase, a combination of simple dietary suggestions and dietary supplements may be used. This phase may or may not be started before getting results from the lactulose breath test. Most bacteria are present in biofilms, not as single-acting cellsThe popular image of bacteria depicts single cells floating around, releasing toxins and damaging the host. However, most bacteria do not exist in this planktonic form in the human body, but rather in sessile communities called biofilms. To form a biofilm, bacteria first adhere to a surface and then generate a polysaccharide matrix that also sequesters calcium, magnesium, iron, or whatever minerals are available. Within a biofilm, one or more types of bacteria and/or fungi share nutrients and DNA and undergo changes to evade the immune system. Since it requires less oxygen and fewer nutrients and alters the pH at the core, the biofilm is a hostile community for most antibiotics. In addition, the biofilm forms a physical barrier that keeps most immune cells from detecting the pathogenic bacteria. ​In many cases Dr. Coombs will use a biofilm disruptor to break up this biofilm material in order for SIBO treatments to be more effective.